• Thoughts and Reflections - this is the same video interview with Jim Jarmusch which first appeared on Criterion's 2002 DVD release of Down by Law. In it, the director discusses the production history of the film, his attitude towards music and its placement in his work, the city of New Orleans and its culture and history, the cast, etc. The interview was recorded exclusively for Criterion in 2002. In English. (74 min). • Robby Muller Interview - this interview also appears on Criterion's 2002 DVD release of Down by Law. In it, cinematographer Robby Muller discusses his collaboration with director Jim Jarmusch and the visual style of Down by Law. The interview was recorded exclusively for Criterion at the Hortus Botanical Garden in Amsterdam in 2002. In English, not subtitled. (23 min, 1080i). • Cannes Film Festival - footage from the press conference and an interview with actor-composer John Lurie from the 1986 Cannes Film Festival, where Down by Law was nominated for the prestigious Palme d'Or Award. -- Press Conference - features director Jim Jarmusch, executive producer Otto Grokenberger, actor-composer John Lurie, and actors Nicoletta Braschi and Roberto Benigni. In English, not subtitled. (42 min, 1080i). -- John Lurie Interview - this interview was shot for French television during the Cannes Film Festival. In 2002, John Lurie recorded a commentary track to accompany the interview, which is included here. In English, not subtitled. (12 min, 1080i). • Outtakes - a gallery of outtakes assembled by Jay Rabinowitz, apprentice editor on Down by Law. In English, not subtitled. (25 min, 1080i). • "It's All Right With Me" - Tom Wait's cover of Cole Porter's classic, which was recorded for the 1990 AIDS benefit album Red Hot + Blue. 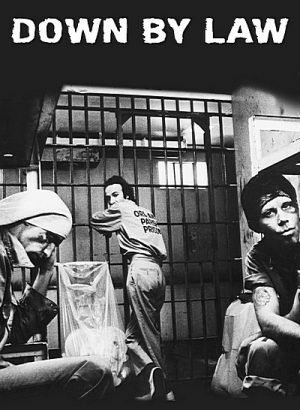 The music video for the cover was directed by Jim Jarmusch in LA in 1989. A bonus video interview with Jim Jarmusch discussing the making of the video is also included. -- Video (5 min, 1080i). -- Jarmusch on the Video (3 min, 1080p). • Q&A with Jim - in 2002, Criterion invited fans to send in questions for director Jim Jarmusch about Down by Law. In this audio piece, the acclaimed director answers various questions that came from all around the world. In English, not subtitled. (25 min, 1080p). • Phone Calls - in 2002, director Jim Jarmusch decided to call Tom Waits, Roberto Benigni, and John Lurie and talk to them about their work on Down by Law. The director taped these conversations with a portable device. Audio only. 1. Roberto Benigni. (13 min). 2. Tom Waits (29 min). 3. John Lurie (25 min). • Production Polaroids - this gallery features some of first assistant cameraman Jack Anderson's Polaroid test shots for the various camera setups in Down by Law. (1080p). • Location Stills - a collection of rare behind-the-scenes photos taken by key grip Paul Ferrera, former photographer for the Doors, and first assistant cameraman Jack Anderson. (1080p). • Trailer - original theatrical trailer for Down by Law. In English, not subtitled. (3 min, 1080i). • Jarmusch on Dubbing - Jim Jarmusch quickly explains why he dislikes dubs. In English, not subtitled. (3 min, 1080p).